What animal carries a refrigerator on its back? The camel. Well, not exactly, but a camel’s humps do store fat, which the camel uses for energy when food is scarce. 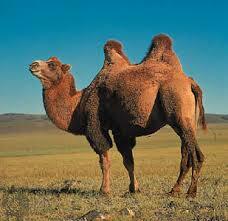 In fact, these humps are so efficient that a camel can go for up to several months with no food. They can even survive up to one week without water. All About Camels: Main body parts of a Camel. It’s a good thing camels don’t need a lot of food or water because they live in one of the toughest climates on the planet. Camels have lived in the deserts of the Middle East and Africa for thousands of years. The climate is hot and dry and food and water are scarce. Bactrian camels live only in China and Mongolia. They have two humps. Dromedary camels live in the Middle East. They have one hump. Bactrian camels live only in China and Mongolia. They have two humps. People in the Middle East use camels like horses. They ride them and use them to carry things. Camels can carry up to 200 pounds. They can reach a height of 7 ft.
Camels look big and awkward, but they can move as fast as a horse. As fast as 40 mph. Camels have long eyelashes and a protective eyelid to keep out sand in the desert during sandstorms. They can even close their nostrils. Camels are born without humps. A baby camel is call a calf, a male adult is a bull and a female adult is a cow. The scientific name for a camel is “Camelus”. A camel will spit and kick if provoked in self defense. The spit is vomit, not nice. A cow (female camel) will give birth to one calf. Although there are still wild camels roaming around in parts of the world, camels became domesticated around 5,000 years ago. Camel racing is a very popular sport in countries like Pakistan, Australia, Egypt and Bahrain. Apart from being a beautiful looking animal the word camel actually means “beauty” in Arabic. 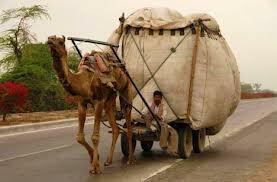 Camels can be used to carry weight. Camels are herbivores. They eat grass and even thorny plants. A video about 5 unusual facts about camels. 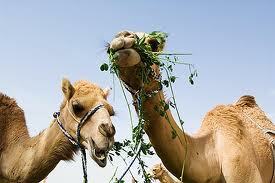 Question: What do camels eat? Answer: Camels are herbivores. They eat grass and even thorny plants. Sometimes they eat fish. They have smelly breath. Question: How long do camels live? Answer: Camels can live up to 50 years. Question: Do camels sweat in the heat? Answer: A camel will sweat but only when temperatures reach over 106 degrees (41.11 Celsius). Enjoyed the Easy Science for Kids Website all about Camels info? Take the FREE & fun all about Camels quiz and download FREE Camels worksheet for kids. For lengthy info click here.